Stages are the fundamental units of chronostratigraphy and stage boundaries have to be defined by Global Stratotype Section and Point (GSSP). The International Commission on Stratigraphy (ICS) require that its Subcommissions choose a GSSP for each international chronostratigraphy boundary and issued Guidelines (Cowie et al, 1986; Remane et al. 1996). The two basic principles of the Guidelines are: 1) Correlation precedes definition: before defining a boundary by a GSSP, its correlation potential has to be tested very carefully, otherwise the boundary definition would be of little practical value. 2) The units of the global chronostratigraphic standard are defined by GSSPs, which is a point in the rock. 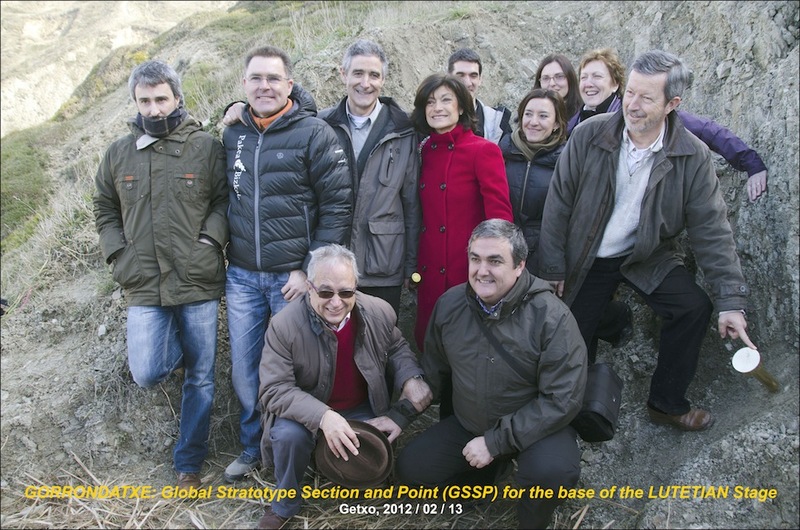 The International Subcommission on Paleogene Stratigraphy (ISPS) decided to set up a working group to select a GSSP for the base of the Lutetian Stage and appointed Prof. Eustoquio MOLINA to be its chairman and he appointed Dr. Silvia ORTIZ as secretary. The chairman and secretary sent letters to well known specialists in Eocene stratigraphy in order to invite them to join the working group. 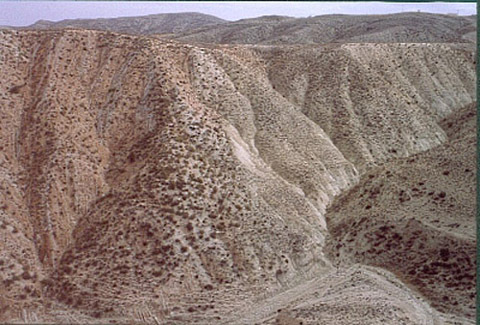 The Ypresian/Lutetian boundary statotype has to be defined in an event correlable with the base of the Lutetian, which is a standard stage of the Eocene (Jenkins and Luterbacher,1992). Originally, the Lutetian was defined by De Lapparent in 1883 and revised by Blondeau (1981), who proposed a new stratotype 50 km North of Paris. 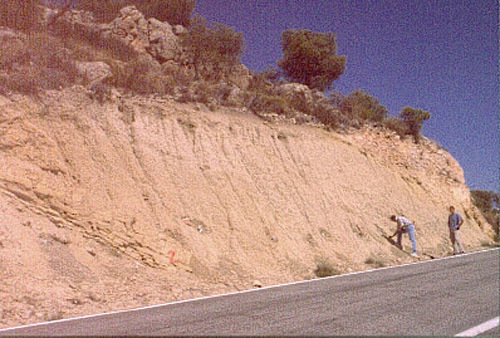 The boundary stratotype has to be defined by a point in a lithological level, coinciding with an easily correlable event, in a suitable marine continuous section, preferably out of the Paris basin where the Lutetian stage was defined, since the Lutetian in the Paris basin is a sedimentary sequence between two hiatuses. An important problem is the scarcity of continuous sections at the Ypresian/Lutetian transition due to the large offlap/sea level fall event that cuts out part or all NP13/14 in many sections. This hiatus is very frequent in the Atlantic Ocean (Aubry, 1995). In the Paris Basin, the terminal Cuisian is NP12 basal and the basal Lutetian is NP14 terminal, the hiatus is of about 4 Ma (Steurbaut, 1988). Consequently, the GSSP will have to be located in a deep water section with minimal evidence of disturbance, transport and erosion. According to the ICS Guidelines a suitable section has to fulfill a series of prerequisites since the function of the type-section is to give an unbiased and complete record of the most relevant marker events. However, we have to be aware of the fact that the absolutely perfect type-section will often not exist. In this sense, the prerequisites enumerated below are intended to characterize the ideal type-section and most of them must be, but not all of them can be fulfilled in every case. Geological prerequisites: Exposure over an adequate thickness of sediments. Continuous sedimentation. The rate of sedimentation should be high enough. Normal succession of strata. Freedom from metamorphism and strong diagenetic alteration. Biostratigraphic prerequisites: Abundance and diversity of well preserved fossils. Freedom from vertical facies changes. Favourable facies for long range biostratigraphic correlations (open marine environment). Other prerequisites: Amenability to radiometric dating, magnetostratigraphy and chemostratigraphy. Possibility to fix a permanet marker. Accessibility. Free access. Permanent preservation of the site. A suitable section is being sought and proposal of candidates for multidisciplinary studies are encouraged. We have to select an event to define a point in a suitable section. During the last few years the more active members of the working group visited and sampled several sections in Italy, Israel, Tunisia, Morocco, Mexico and Argentina, but unfortunately none of them is a good candidate. In shallow marine environments such as the Austral Basin (Punta Torcida) in Tierra del Fuego, Argentina there is a widespread hiatus between the Early and Middle Eocene. In Spain many sections were visited and sampled in the Betic Cordilleras (Alamedilla, Agost, Fortuna, etc.) and in the Pyrennees (Anoz, Campo, Gorrondatxe, Guetaria, etc.). Most of these Pyrennean sections are not ideal and plagued with hiatuses, restricted facies, tectonic complications and other problems... At present, one of the most suitable section seems to be the Agost section in Alicante province (Molina et al. 2000). Lately, our studies have concentrated on the deep water Fortuna section (Murcia province, Betic Cordilleras) which holds potential to become a good candidate mainly because the Ypresian/Lutetian transition is within very well exposed hemipelagic marls. The planktic foraminiferal biostratigraphy was published by Gonzalvo et al. 2001). Recently, a new section has been found in the Agost region about one kilometre far from the section studied by Molina et al. (2000).This new section is better exposed and is a suitable candidate. Furthermore, the Gorrondatxe section was proposed as another candidate (Payros et al., 2007). Lately, the research has been focused on the study of the two more suitable sections to define the Lutetian GSSP: Agost and Gorrondatxe sections. The results of both sections show that the different events traditionally used to place the Ypresian/Lutetian boundary, previously thought to be almost simultaneous, actually occur at very different levels. The more close events to the base of the original Lutetian stage seem to be the first occurrence of the calcareous nannofossil Blackites inflatus at the base of Subzone CP12b and the first occurrence of the planktic foraminifera Turborotalia frontosa. The integrated magnetobiostratigraphic studies carried out at the Agost and Gorrondatxe sections provides conclusive evidence that both sections are almost continuous and contain diverse and well-preserved fossil groups. However, the Gorrondatxe section seems to be more suitable than the Agost section and it is now the leading candidate. The criterion and the section to precisely define the Ypresian/Lutetian boundary will be decided in September 2009 in a workshop of the Ypresian/Lutetian working group that will be organized near the Gorrondatxe section in Bilbao. The Ypresian/Lutetian Working Group decided, during the Workshop in Getxo (near Bilbao, Spain) in September 26, 2009 to define the Lutetian GSSP at meter 167.85 of the Gorrondatxe section in a dark marly level where the nannofossil Blackites inflatus first appears, 48 Ma ago. Two canditate sections Agost and Gorrondatxe where proposed and the Lutetian GSSP at Gorrondatxe was elected by consensus after long discussions. 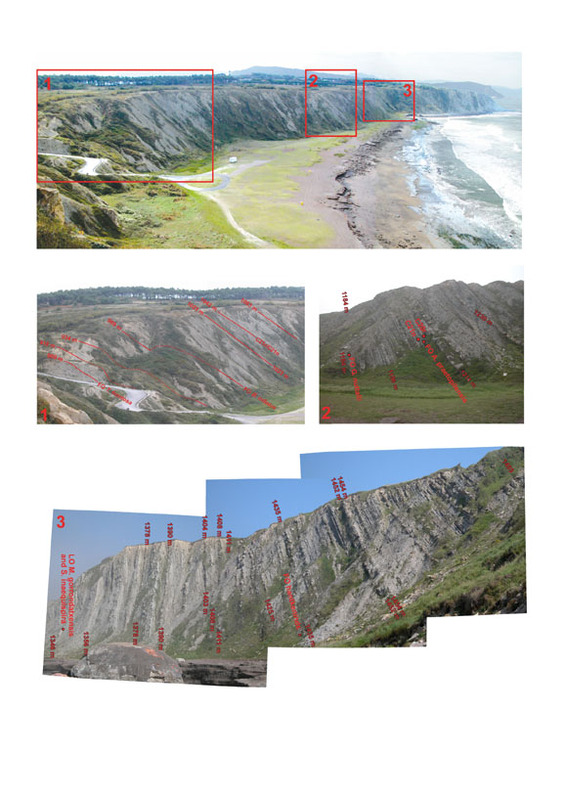 The GSSP for the base of the Lutetian Stage (early/middle Eocene boundary) is defined at 167.85 meters in the Gorrondatxe sea-cliff section (NW of Bilbao city, Basque Country, northern Spain; 43º22'46.47" N, 3º 00' 51.61" W). This dark marly level coincides with the lowest occurrence of the calcareous nannofossil Blackites inflatus (CP12a/b boundary), is in the middle of polarity Chron C21r, and has been interpreted as the maximum flooding surface of a depositional sequence that may be global in extent. The GSSP age is approximately 800 kyr (39 precession cycles) younger than the beginning of polarity Chron C21r, or ~47.8 Ma in the GTS04 time scale. The proposal was approved by the International Subcommission on Paleogene Stratigraphy in February 2010, approved by the International Commission of Stratigraphy in January 2011, and ratified by the International Union of Geological Sciences in April 2011. After this process, the official publication by Molina et al. (2011) was published in Episodes. On the left Alberto Riccardi (chairman of IUGS), Xabier Orue-Etxebarria (professor Univ. 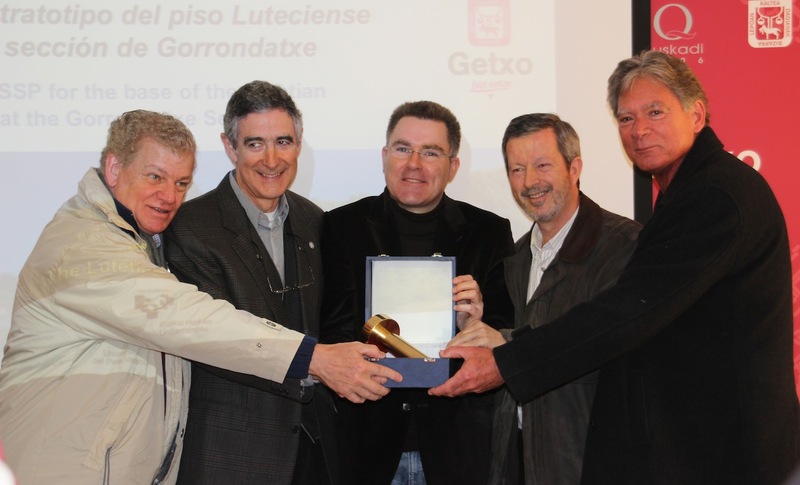 Basque Country), Imanol Landa (major of Getxo), Eustoquio Molina (chairman of ISPS) and Stan Finney (chairman of ICS) showing the golden spike. 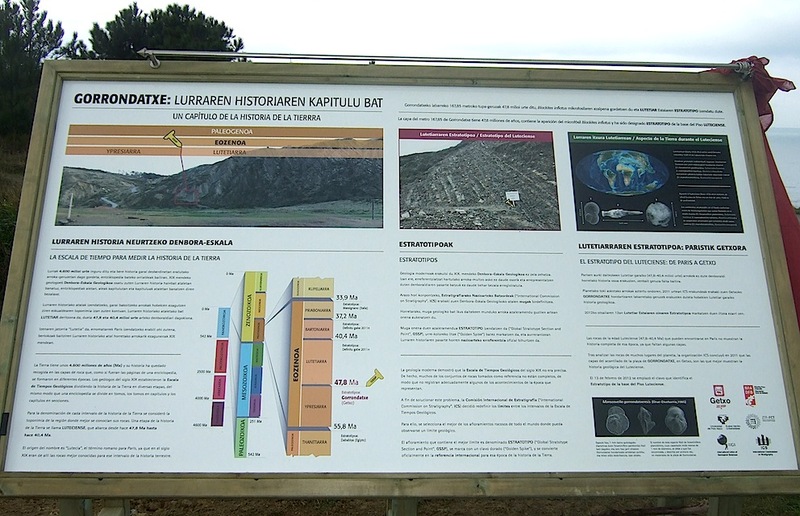 On the right the pannel explaining the geology of the Lutetian GSSP at Gorrondatxe section. On the left the Spanish Working Group with the mayor of Getxo and the dean of the Faculty of Sciences after placing the golden spike. 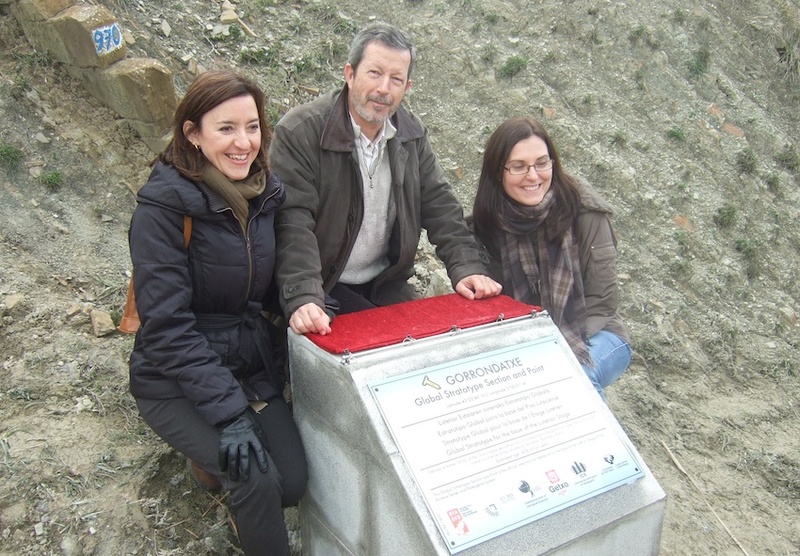 On the right Laia Alegret (secretary of ISPS), Eustoquio Molina (chairman of ISPS and the Working Group) and Silvia Ortiz (secretary of the Working Group) showing another pannel near the golden spike. The Working Group on Ypresian/Lutetian Boundary Stratotype was open to everybody interested to participate in the search of the GSSP. Laia ALEGRET (Benthic foraminifera). Universidad de Zaragoza. Spain. Estibaliz APELLANIZ (Planktic foraminifera) University of Basque Country. Spain. Willian A. BERGGREN (Chronostratigraphy). Woods Hole Oceanographic Inst. USA. Gilen BERNAOLA (Nannofossils). University of Basque Country. Spain. Fernando CABALLERO (Planktic foraminifera). University of Basque Country. Spain. Vlasta COSOVIC. (Larger Foraminifera). University of Zagreb. Croatia. Jaume DINARES-TURELL. Istituto Nazionale di Geofisica. Roma. Italia. Concepción GONZALVO (Planktic foraminifera) Universidad de Zaragoza. Spain. Juan Cruz LARRASOAÑA (Magnetostratigraphy). Instituto Jaume Almera, Barcelona. Spain. Miguel A. MANCHEÑO (Mineralogy). Universidad de Murcia. Spain. Eustoquio MOLINA (Foraminifera). Universidad de Zaragoza. Spain. Simonetta MONECHI (Nannofossils). University of Florence. Italy. Silvia ORTIZ (Benthic foraminifera). Universidad de Zaragoza. Spain. Xabier ORUE-ETXEBARRIA (Planktic foraminifera). University of Basque Country. Spain. Aitor PAYROS (Planktic foraminifera), University of Basque Country. Spain. Francisco RODRIGUEZ-TOVAR (Trace fossils). University of Granada. Spain. Birger SCHMITZ (Isotopes). University of Goteborg. Sweden. Flavia TORI (Calcareous Nannofossils). University of Florence. Italy. Ellen THOMAS (Benthic foraminifera). Wesleyan University. USA. Josep TOSQUELLA (Nummulites). University of Huelva. Spain. Alfred UCHMAN (Trace fossils). Jagiellonian University, Krakow. Poland. 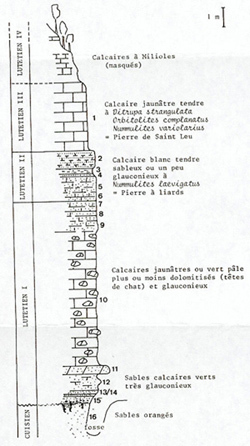 Noël VANDENBERGHE (Chronostratigraphy). University of Leuven. Belgium. Katharina Von SALIS (Nannofossils). Geological Institute. ETHZ. Switzerland. A selection of papers on the Ypresian/Lutetian boundary problem are listed below. Please send us additional references, which we will be glad to add to this list. ALI, J.R. & HAILWOOD,E.A. 1995. Magnetostratigraphy of upper Paleocene through lower middle Eocene strata of NW Europe. In: BERGGREN,W.A., KENT,D.V., AUBRY,M.-P. & HARDENBOL,J. (eds). Geochronology, time scales and stratigraphic correlation: framework for an historical geology. Soc. Econ. Paleontologists and Mineralogists Spec. Pub., 54, 271-274. ALI,J.R., KING,C. & HAILWOOD,E.A. 1993. Magnetostratigraphic calibration of early Eocene depositional sequences in the southern North Sea Basin. In: HAILWOOD,E.A. & KIDD,R. (eds). High resolution stratigraphy in modern and ancient marine sequences. Geol. Soc. Lond. Spec. Pub., 70, 99-125. AUBRY, M.P. (1983): Biostratigraphie du Paléogène épicontinental de l'Europe du Nord-Ouest. Etude fondée sur les nannofossiles calcaires. Doc. Labo. Faculte Sciences Lyon, 89, 320 p.
AUBRY, M.P. (1995): From Chronology to Stratigraphy: interpreting the Lower and Middle Eocene stratigraphic record in the Atlantic Ocean. SEPM Special Publication. 54, 213-274. BENIAMOVSKI, V.N., ALEKSEEV, A.S., OVECHKINA, M.N. & OBERHÄNSLI, H. (2003): Middle to upper Eocene dysoxic-anoxic Kuma Formation (northeast Peri-Tethys): Biostratigraphy and paleoenvironments. Geological Society of America, Special Paper 369, 95-112. BEN ISMAIL-LATTRACHE, K. & BOBIER, C. (1996): Étude biostratigraphique, paléoécologique et paléobiogéographique des séries éocénes (Yprésien-Lutétien basal) de Tunisie centrale. Géologie de l'Afrique et de l'Atlantique Sud: Actes Colloques Angers 1994, 563-583. BERGGREN, W.A., KENT, D.V., SWISHER, C.C. & AUBRY, M.A. (1995): A revised Paleogene geochronology and chronostratigraphy. In Berggren, W.A., Kent, D.V. and Hardenbol, J., eds. Soc. Econ. Geol. Paleont. Spe. Public. 129-212. BIGG, P.J. (1982): Eocene planktonic foraminifera and calcareous nannoplankton of the Paris Basin and Belgium. Revue de Micropaléontologie. 25, 2, 69-89. BIGNOT, G. & LE CALVEZ, Y. (1969): Contribution à l'étude des Foraminifères planctoniques de l'Éocene du Bassin de Paris. Proc. First Int. Conf. Plankt. Microf., 1967, 1, 161-166. BIGNOT, G. & STROUGO, A. (2002): Les associations de foraminifères benthiques de l'Eocène d'Egypte nord-orientale, indicateurs chronologiques et témoins des lagons péritéthysiens. Revue de Micropaléontologie. 45, 2, 73-98. BLONDEAU, A. (1981): Lutetian. Bull. Inf. Géol. Bassin Paris, 2, 167-180. BLONDEAU, A. & CAVELIER, C. (1962): Etude du Lutetien inferieur de Saint-Leu-d'Esserent (Oise). Bull. Soc. geol. France. 7(4), 55-63. BOUKHARY, M., EL SAFORI, Y.A., DECROUEZ, D. & FARIS, MM. (2006). 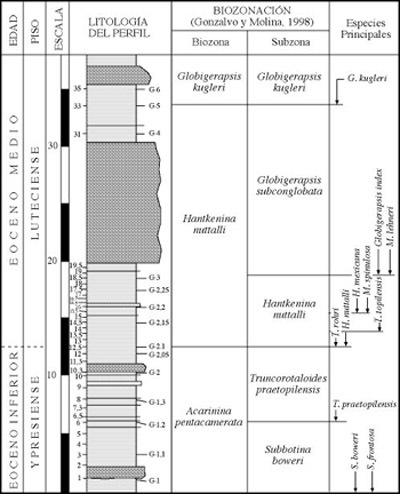 Bio- and isotope stratigraphy of the Lower/Middle Eocene section at Gebel Hafit area, United Arab Emirates. N. Jb. Geol. Paläont. Mh. 2006(3), 129-147. BOUKHARY, M., DECROUEZ, D. & EL SAFORI, Y.A. (2006). Somalina praestefaninii n. sp., a New Species of Large Foraminifera from the Damman Formation (Lutetian) of Gebel Hafit, United Arab Emirates. Geologia Croatica. 59(2), 99-107. Boukhary, M. , Kenawy, A. & Basta , R. (2009) .- Early Eocene Nummulitids from Gebel Umm Russeies, El Galala El Bahariya, Eastern Desert, Egypt.-Geologia Croatica , 62/1, pp. 1-18 , 6 figs. ,4 tabs., 6 pls, Zagreb . Boukhary,M .& Scheibner,Ch. (2009).- On the Origin of Nummulites: Urnummulites schaubi n. gen. n.sp., from the Late Paleocene of Egypt.-Micropaleontology, vol. 55, no. 4, pp. 413 – 420, (New York). Boukhary, M., Hussein-Kamel, Y., Abdelmalik, W. and Besada, M. (2011).-Ypresian Nummulites from the Nile Valley and theWestern Desert of Egypt: Their systematic and biostratigraphic significance.- Micropaleontology, vol. 57, no. 1, plates 1-9, text-figures 1-16, tables 1-9, pp. 1-35. (New York). Boukhary, M., Bassiouni, M.E., Hewaidy, A. Luterbacher, HP. and Al-Hitmi, H. (2011).- Foraminifera and ostracodes of Early Eocene Umm er Radhuma Formation, Dukhan Oil Field, Qatar.- Micropaleontology, vol. 57, no. 1, plates 1-6, text-figures 1-3, tables 1-2, pp. 37-60. (New York). Boukhary, M., Hussein, A. I.M. 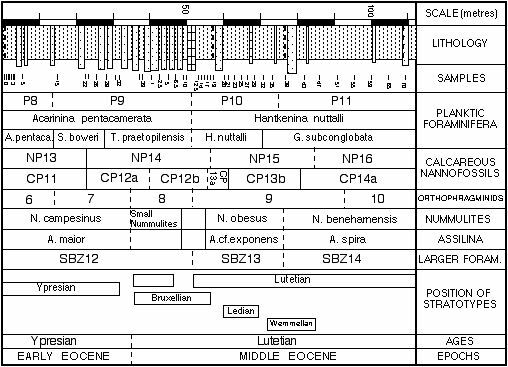 and Kamal D.(2010) .- Precursors of the Nummulites gizehensis and N. partschi group from Egypt.- Journal of African Earth Sciences, Vol. 56, pp. 43- 54, (Elsevier). Boukhary, M. and Scheibner, Ch. (2011).- New Paleocene large cassiduline foraminifera (Cassidinidae fam.nov., Miscellanacea) from Egypt and its phylogeny. - Historical Biology, 23: 2, 177 — 194 (Ireland). DOI: 10.1080/08912963.2010.507329. BRÖNNIMANN, P., CURRY, D., POMEROL, CH. & SZÖTS, E. (1968): Contribution à la connaissance des Foraminifères planctoniques de l'Eocene, incluant le Paléocène, du Bassin anglo-franco-belge. Mem. B.R.G.M., 58, 101-108. CAVELIER, C. & POMEROL, CH. (1986): Stratigraphy of the Paleogene. Bulletin de la Société géologique de France, 2, 273-276. CHATEAUNEUF, J.J. & GRUAS-CAVAGNETTO, C. (1978): Les zones de Wetzeliellaceae (Dinophyceae) du Bassin de Paris. Bull. B.R.G.M., (2), sect. 4, 2. COLOM, G. (1954): Estudio de las biozonas con foraminíferos del Terciario de Alicante. Boletín del I.G.M.E., 66, 279 p.
COXALL, H.K., PEARSON, P.N., SHACKLETON, N.J. & HALL, M.A. (2000): Hantkeninid depth adaptation: An evolving life strategy in a changing ocean. Geology, 28(1), 87-90. COXALL, H.K., HUBER, B.T. & PEARSON, P.N. (2003): Origin and morphology of the Eocene planktonic foraminifer Hantkenina. Journal of Foraminiferal Research, 33(3), 237-261. COWIE, J.W., ZIEGLER, W., BOUCOT, A.J., BASSETT, M.G. & REMANE, J. (1986): Guidelines and Statutes of the International Commission on Stratigraphy (ICS9. Courier Forschungsinst Sckchemberg., 83, 1-14. GONZALVO, C. (1997): Bioestratigrafía y evolución de las asociaciones de foraminíferos planctónicos del tránsito Eoceno inferior-Eoceno medio en Alamedilla (Granada, Cordillera Bética). In: Avances en el conocimiento del Terciario Ibérico (eds: J.P. Calvo y L. Morales), 101-104. GONZALVO, C. (1999). Evolución de las asociaciones de foraminíferos planctónicos del tránsito Eoceno Inferior-Eoceno Medio en la península Ibérica (Agost, Cordillera Bética y Anoz, Pirineos). Geogaceta, 24, 157-160. GONZALVO, C. & MOLINA, E. (2003): Bioestratigrafía con foraminíferos planctónicos del límite Ypresiense/Luteciense de Fortuna (Cordilleras Béticas, España). Geotemas. 5, 113-116. GONZALVO, C., MANCHEÑO, M.A., MOLINA, E. RODRIGUEZ ESTRELLA, T. & ROMERO, G. (2001). El límite Ypresiense / Luteciense en la Región de Murcia (Cordillera Bética, España). Geogaceta 29, 65-68. HOOYBERGHS, H.J.F. (1992): A new dating of the Brussels Sand Formation (Lower-Middle Eocene) on planktonic foraminifera from St-Stevens-Woluwe and Neerijse, Belgium. Tertiary Reseach, 14, 33-49. HOOYBERGHS, H.J.F. (1999): Foraminifera of the Lower to Middle Eocene deposits in the Mont-des-Récollets at Casel (N.France). Aardk. Mededel. 9, 147-152. ISUMAN, N. (1983): Mikropaläontologische Untersuchungen von Grossforaminiferen (Nummuliten und Assilinen) in Alttertiär von Südostspanien (Aspe und Agost in der Provinz Alicante). Berliner geowiss. Abh. A., 49, 61-170. JANIN, M.C., BIGNOT, G., STROUGO, A. & TOUMARKINE, M. (1993): World wide discoaster ray number variability at the early/middle Eocene boundary. Implication for the neritic sequences of the Nile Valley (Egypt). Newsletters on Stratigraphy. 28(2/3), 157-169. JENKINS, D.G & LUTERBACHER H. (1992): Paleogene stages and their boundaries (Introductory remarks). Neues Jarhbuch fur Geologie und Paläontologie, Abh., 186, 1-5. LESS, G. (1998): The zonation of the Mediterranean Upper Paleocene and Eocene by Orthophragminidae. DELA-Opera SAZU 4 razr. 34(2), 21-43. MANCHEÑO, M.A., RODRIGUEZ-ESTRELLA, T., ROMERO, G., HERNANDEZ, J.M., ARANA, R. & FERNANDEZ, M.T. (2003): Mineralogía del límite Ypresiense/Luteciense de Fortuna (Murcia). Geogaceta. 34, 135-138. MARQUEZ, L. (1991): El Eoceno inferior y Medio de Agost (Provincia de Alicante). Revista Española de Paleontologia, nº Extra, 197-204. MARQUEZ, L. & USERA, J. (1984): Bioestratigrafía (foraminíferos) del Eoceno de la localidad de Agost (Provincia de Alicante). Acta Geologica Hispanica, 19, 19-28. MARTINI, E. (1971): Standard Tertiary and Quaternary calcareous nannoplankton zonation. In Farinacci, A. (Ed.) Proc. 2nd Plankt. Conf., Roma, vol. 2, p. 739-785. MOLINA, E., ARENILLAS, I. 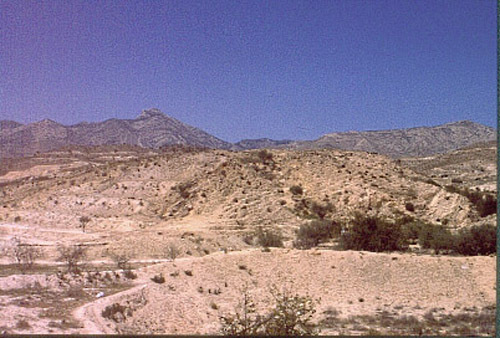 & GONZALVO, C. (1996): Field trip guide to the Paleocene-Middle Eocene of Agost, Caravaca and Alamedilla sections. In: Abstracts and Field Trip Guides, Early Paleogene Stage Boundaries. International Meeting and Field Conference in Zaragoza (Spain), June 24-29, (1996), 73-103. NOLF, D. & STEURBAUT, E. (1990): Stratigraphie de l´Eocène en Flande occidentale et dans les régions limitrophes. Bull. d´Informat. Géol. Bassin Paris, 27(3), 9-36. OKADA, H. & BUKRY, D. (1980): Supplementray modification and introduction of code numbers to the low-latitude coccolith biostratigraphic zonation: Marine Micropaleontology, 5, 321-325. OLIVERO, E.B. & MALUMIAN, N. (1999): Eocene Stratigraphy of Southeastern Tierra del Fuego Island, Argentina. AAPG Bulletin. 83(2), 295-313. ORTIZ, S. & MOLINA, E. (2003): Foraminíferos bentónicos como indicadores de un evento hipertermal en el tránsito Ypresiense-Luteciense del corte de Fortuna (Murcia, Cordillera Bética). Geotemas. 5, 185-188. ORUE-ETXEBARRIA, X. & APELLANIZ, E. (1985): Estudio del límite Cuisiense-Luteciense en la costa vizcaina por medio de foraminiferos planctónicos. Newsletters on Stratigraphy. 15(1), 1-12. ORUE-ETXEBARRIA, X., PAYROS, A., BERNAOLA, G., DINARES-TURELL, J., TOSQUELLA, J., APELLANIZ, E. & CABALLERO, F. (2006). The Ypresian/Lutetian boundary at the Gorrondatxe beach section (Basque Country, W Pyrennees). Field Excursion Guidebook, Climate & Biota of the Early Paleogene. 33 pp. PEARSON, P. et al. (12 coauthors) (2004). Paleogene and Cretaceous sediment cores from the Kilwa and Lindi areas of coastal Tanzania: Tanzania Drilling Project Sites 1-5. Journal of African Earth Sciences. 39, 25-62. PERCH-NIELSEN, K. (1985): Cenozoic calcareous nannofossils. In Bolli, H.M., Saunders, J.B. and Perch-Nielsen, K. (Eds): Plankton Stratigraphy. Cambridge University Press, 427-554. REMANE, J. (2003): Chronostratigraphic correlations: their importance for the definition of geochronologic units. Palaeogeography, Palaeoclimatology, Palaeoecology. 196, 7-18. REMANE, J., BASSETT, M.G., COWIE, J.W., GOHRBANDT, K.H., LANE, R., MICHELSEN, O. & NAIWEN, W. (1996): Revised guidelines for the establishment of global chronostratigraphic standards by the International Commission on Stratigraphy. Episodes, 19, 77-81. RHODES,G.M., ALI,J.R., HAILWOOD,E.A., KING,C. & GIBSON,T.C. (1999): Magnetostratigraphic correlation of Paleogene sequences from northwest Europe and North America. Geology, 27, 451-454. SCHAUB, H. (1981): Nummulites et Assilines de la Téthys paléogène. Taxinomie, phylogenèse et biostratigraphie. Mém. Suiss. Paléont., 104-105, 236 p.
SERRA-KIEL, J., HOTTINGER, L., CAUS, E., DROBNE, K., FERRANDEZ, C., JAUHRI, A.K., LESS, G., PAVLOVEC, R., PIGNATTI, J., SAMSO, J.M. SCHAUB, H., SIREL, E., STROUGO, A., TAMBAREAU, Y., TOSQUELLA, J. 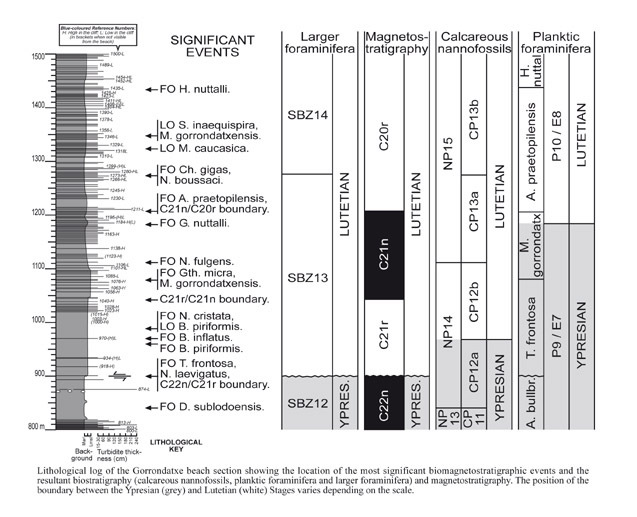 & ZAKREVSKAYA, E. (1998): Larger foraminiferal biostratigraphy of the Tethyan Paleocene and Eocene. Bulletin de la Société géologique de France. 169, 281-299. STEURBAUT, E. (1988. ): New Early and Middle Eocene calcareous nannoplankton events and correlations in middle to high latitudes of the northern hemisphere. Newsletter on Stratigraphy, 18, 99-115. SZTRÁKOS, K.(2000): Les foraminifères de l'Eocène du bassin de l'Adour (Aquitaine, France): bioestratigraphie et taxonomie. Revue de Micropaléontologie, 42, 1-2, 71-172. Von HILLEBRANDT, A. (1974): Bioestratigrafía del Paleógeno en el Sureste de España (Provincias de Murcia y Alicante). Cuadernos de Geología, 5, 135-153. Von HILLEBRANDT, A. (1976): Los foraminíferos planctónicos, nummulítidos y cocolitofóridos de la zona de Globorotalia palmerae del Cuisiense (Eoceno inferior) en el SE de España (Provincias de Murcia y Alicante). Revista Española de Micropaleontologia, 8, 323-394. WEI, W. & WISE, S.W. (1989): Paleogene calcareous nannofossil magnetobiochronology: Results from South Atlantic DSDP Site 516. Marine Micropaleontology. 14, 119-152.